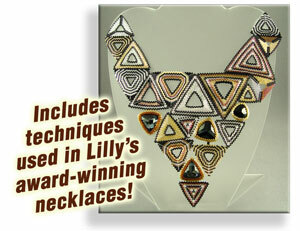 Learn to combine the Peyote Stitch with the Ndebele Stitch to create the perfect triangle. This kit includes eight colors of Silver-lined and Aurora Borelis Japanese Delica beads. They are the most uniform in size and shape seed bead. With Delicas you get a more clean and precise design; they seem to lock together. The kit also includes Fire Line Beading fiber, a beading needle size 12, and plenty of Delica beads for experimentation. The kit includes detailed instructions with photographs and illustrations for three different triangles, plus the Triangle Toggle. Each instruction differs slightly, so study and practice each one. The instructions are written to start with the easiest triangle to the more complex three-dimensional toggle triangle. Using our detailed instructions, you create stripes, sections, and lines of colors emphasizing the geometry of the triangle. 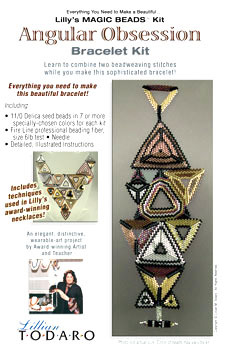 Then simply puzzle-fit them and stitch them together to complete a contemporary bracelet. You can also make stylish earrings! 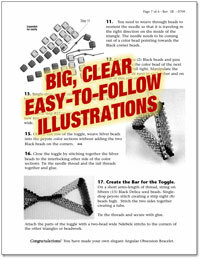 You also learn the three-dimensional Toggle Clasp, which offers infinite design uses and variations. Explore the creative possibilities of this wonderful geometric shape to create simple, yet irresistible jewelry. Included are more than enough components to make a bracelet that we sell at art and craft shows (with Lilly’s love and care) for $225 and up. Order yours in these timeless colors now!